With these concepts, techniques, and gadgets you can establish your position from astronomical observations. You can also keep track of your changing position during a trip, for example by bringing the method of dead reckoning into consideration. Until now, however, an important aspect of navigation (which is relevant whether you use celestial or not) has not been addressed by our suite: trip planning, also known as sailings calculations. We are pleased to announce that we now provide this additional capability in the latest extension to our suite. Determining the direction (course) in which to sail (and knowing in advance the length of the journey) is an essential skill that any navigator must have. For short trips one may directly measure the constant rhumb-line course on a Mercator chart for the path that connects the point of departure with the destination. However, the bigger the separation between departure and destination, the more extra distance is associated with the rhumb-line path compared to the shorter great-circle path, especially in higher latitudes. The problem is that attempting to follow the requisite great circle is very difficult since it requires a continuous adjustment of heading. Thus, on the one hand, the great-circle route (orthodrome) is shortest but it is difficult to steer. On the other hand, the rhumb-line route (loxodrome) can be well followed along its constant course but it is longer. Each choice thus has a strength that is a weakness in the other one. A solution to this dilemma is outlined, for example, in Bowditch which recommends a hybrid path combining the advantages of the two sailing possibilities. Here the starting point in developing the sailing plan is the shorter great-circle route from departure to destination, but then along that path one identifies waypoints (separated, for example, by 5 degrees of longitude) between which the vessel is to follow easier-to-steer rhumb lines. We illustrate such a calculation using as an example a trip from San Francisco (USA) to Yokohama (Japan) borrowed from Bowditch. This classic publication demonstrates the idea graphically using the chart of the North Pacific Ocean shown in two different projections. First, the great-circle path from San Francisco to Yokohama is found as the straight line connecting the two cities on the gnomonic projection chart. We mark the waypoints as this path crosses meridians separated by 5 degrees of longitude. Second, these waypoints are translated onto the Mercator projection chart on which they are connected by straight-line segments representing rhumb lines. 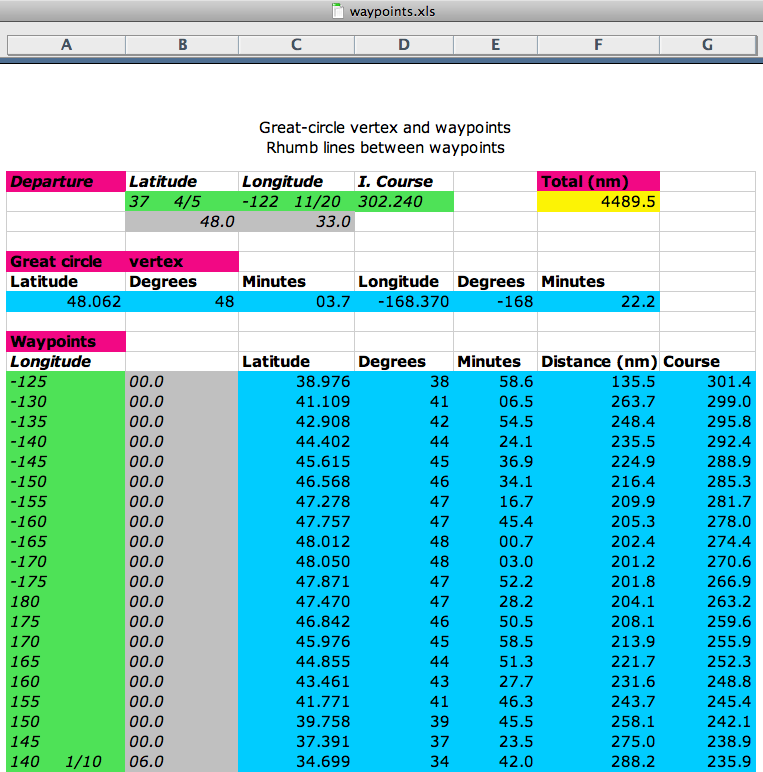 The constant course headings within each successive pair of waypoints can be directly measured on this chart. Our new spreadsheets perform this exact same function (plus the distance calculations) with even higher accuracy, because they are not affected by the inaccuracies of physical plotting on a chart. These coordinates enter the spreadsheet sailings.xls in row 2. The use of this spreadsheet is shown in this YouTube demo video. The differences between the calculated great-circle and rhumb-line paths are substantial. The rhumb line is longer by over 200 miles and its (constant) heading is south of west, while the initial great-circle course is north of west sailing into higher latitudes first. Row 11 displays the coordinates of the vertex, which is the point along the great circle closest to the Pole. The spreadsheet also shows the (relatively minor) differences arising from the use of a perfectly spherical or slightly flattened ellipsoidal model of the Earth surface in the calculation. For our purposes the main result of this spreadsheet is the initial great-circle course displayed in the yellow cell C6. This number, combined with the departure coordinates, completely defines the great circle. The value is shown with three decimal digits (302.240) in order to cut down numerical round-off errors once it is copied as input into the next spreadsheet: waypoints.xls. 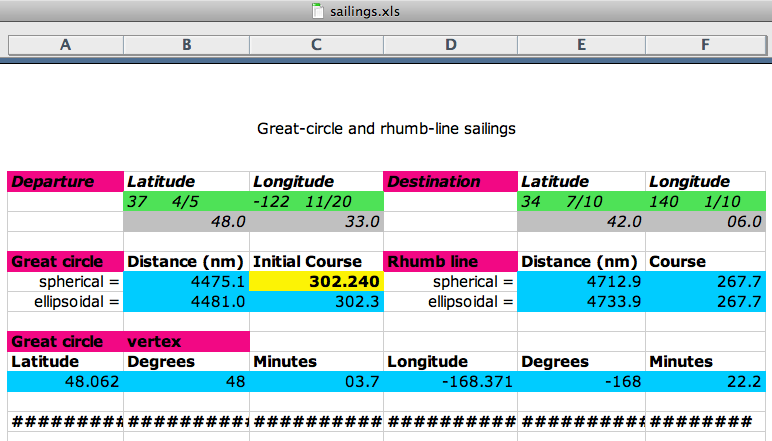 Here, the coordinates of San Francisco and this initial course from sailings.xls enter in row 2. Then, in column A starting in row 11 we begin entering the longitudes of each waypoint. All great circles (except those running across both Poles) intersect every meridian exactly once. The calculated latitude of each waypoint is displayed in columns C, D, E. The rhumb-line distance and course from the previous waypoint (using the flattened Earth model) is shown in columns F and G.
The initial course is north of west so the latitudes of the subsequent waypoints increase at first. The courses between them, however, progressively turn away from north and at longitude W 170º (close to the vertex, row 7) it is essentially due west. The course then heads ever more southward as the path descends back to lower latitudes toward Yokohama. Figure 2404 in Bowditch shows the E 150º waypoint at latitude N 40º, for which waypoints.xls calculates N 39º 45.5′. The last waypoint is the destination itself (Lon: E 140º 06.0′) with the correctly reproduced latitude (N 34º 42.0′). This hybrid path is still longer (cell F2) than the pure great-circle route, but not by much, and it is easier to steer.